For the last few weeks I have been in training. As with any diet, there comes a time when the weight-loss won't happen unless you put in extra effort to shake off some pounds. Determined to hit my Size Zero goal I have been exercising my new regime twice a week...but not at the gym....oh no...I'm not that kind of girl and anyway, the gym is not what this kind of diet needs. My twice weekly workout has been down at our local market and boy oh boy, for a molly-coddled consumer like me who has been brought up on a diet of supermarkets, the market has taken some getting used to. Molly-coddled? Bet you've not heard that phrase associated with supermarkets before but it's TRUE. Let's consider the following factors: easy and often free parking; trolleys that young kids can sit in; shopping in a warm environment; the luxury of filling a trolley as high as you can and wheeling it straight to your car after paying with a credit card (which actually doesn't feel like paying with real money at all). Even better, with online ordering there is the option of doing all this from the comfort of your own living room, without lifting a finger, apart from when you need to click on the mouse. That's a lot of comfort to throw away in the face of market shopping, which offers none of the above luxuries and indeed I hadn't considered them luxuries before I'd embarked on The Rubbish Diet. However, every diet requires a change of habits, which if successfully applied leads to a much healthier lifestyle. Perhaps it's time to look at the evidence and how shopping at the market provides its own recipe for success, despite taking me out of my comfort zone. 1. No car park - no worries: Turn the lack of easy parking into a positive, with a healthy walk from the town centre car-parks or even ditch the car and take the bus. 2. No trolley for the kids - I say if they are too small, leave them in the care of another responsible adult while you shop in peace. Older children can be taken along for the experience and to share the load. Okay, they might complain a little bit, but you should be able to bribe them with something trivial. 3. No shelter from the wind and the rain: at least you can get in and out within a 30 minute pit-stop or 10 minutes if you're quick. You'll feel lucky compared to the poor stall-holders who have to stay out in those conditions all day. Feel happy in the knowledge that you've made it worth their while. 4. No credit card machines: Take the opportunity to use some real money. Take along £20 and I bet you'll find it hard to spend it all. Not just for frugality's sake, but the thought of having to carry it all home. 5. As for the carrying bit: be happy in the knowledge that unless you invest in a pull along trolley, your body will develop biceps in no time at all. 6. And finally, the actual point of this exercise is to work towards Zero Waste and therefore reduce packaging. To achieve this, just take along your own reusable bags and you can put your unpackaged produce straight into them. If you're offered extra bags or packaging that can't be recycled, ask for an alternative. Stall-holders are great people who will be happy to help. We are lucky to have a great market in Bury St Edmunds, which was recently highly commended in a competition run by the National Association of British Market Authorities (NABMA), thanks to a nomination from our very own Ruby who writes the Living in Bury St Edmunds blog. Before The Rubbish Diet I felt that I was too busy to visit the market, or I was put off by the thought of taking the children. With work flooding in and new projects on the go, I am now probably busier than ever but I have been pleasantly surprised how easy market shopping is. I just fit it in around lunch-breaks and pick things up elsewhere as I go along. Saturdays are now spent enjoying an hour to myself, picking up fresh produce in town. It's no longer a hassle. In fact it's now a treat. 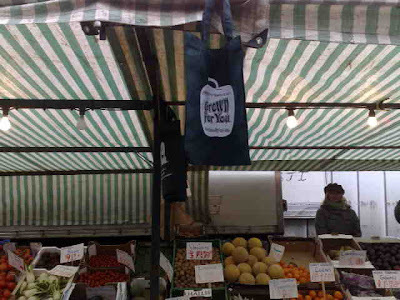 The Stall holders are getting used to my requests to reduce packaging and some of them, including the fruit and veg stall just along from the Early Learning Centre are now offering their own reusable bags (as shown in the main photo). 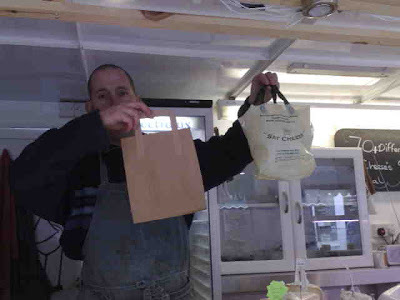 I'd like to give a big 'thumbs up' to William Lewis who owns the Say Cheese delicatessen trailer for responding to my packaging request with great enthusiam. Rather than wrapping the cheese in plastic film, he offered me greasproof paper, which can be composted instead. The other great news is that following advice from his daughter, he has switched over from plastic bags to paper bags. Result! The other news that I've picked up on this week, which will be of interest to Londoners is that the London Assembly has published a report, which is proposing the "Hundred London Market Strategy", to protect and promote markets throughout London. More information can be found at the NABMA website. The only market strategy that I have in mind is to perhaps invest in a shopping trolley. Having carried my shopping from the market to the car parks in the far reaches of town, I feel that I have developed arms like Mr Tickle. If ever you've seen images of Mr Tickle, you will understand what I mean. The character's arms can stretch upstairs, downstairs and in all directions. So this morning, I am able to make a coffee in the kitchen with one hand, while being on the Internet in the lounge with the other. You never know, I may even be able to dispose of whatever little rubbish we create, without having to even leave the house. Although I've been wrapping my sandwiches in greaseproof paper for a while now, I hadn't thought about wrapping my cheese in it. I've been using the dreaded cling film. I'll definitely give that a go! Incidentally, I've still been using cling film for covering cold meat in the fridge. Would greaseproof paper be okay for that too, or do you think I would need something more airtight? Despairing, I use tin foil for covering everything including cold meat. It can usually be recycled with cans and stuff if rinsed. I feel that if young children are not strong enough to be useful and carry your extra bags they should definately be left at home! I love markets and we have a great indoor food market close by that I don't use nearly as much as I should......you've inspored me to gp on Saturday! We have been trying to buy locally produced (or at least UK sourced) fresh produce in the supermarkets, but at this time of the year its amazing how little there is!! Hi Dispairing - great tip about the sandwiches. I'd never thought about the greaseproof paper for that. I'm not sure about cold meat though. An airtight reusable container is probably the best bet. Hi Hamster - tin foil is actually a great idea. Thanks for that. Hi Prepschool mummy - I'm glad you're on my wavelength (and welcome aboard). Hi Baba - I'm glad you've been inspired. It really is a great way to spend the little time that is available for shopping and is also good for the local economy. Don't forget the local farmers' markets too. They are both great options for focusing on seasonal stuff.